Yu-Gi-Oh! 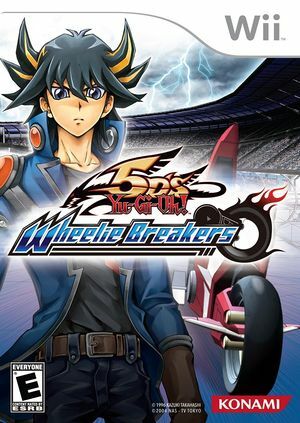 5D's: Wheelie Breakers (遊戯王ファイブディーズ ウィーリーブレイカーズ Yū-gi-ō Faibu Dīzu Uīrī Bureikāzu) is a racing game for the Wii. Rather than following the standard Yu-Gi-Oh! card game, Wheelie Breakers is a racing title based on the card game. Players race along a track picking up cards and earning action points, which are required to put the cards into play and attack. Monster cards are used to attack opponents and protect from direct attacks. When summoned, a monster has a life gauge which, when depleted from enemy attacks, causes them to be destroyed. Monsters require action points to attack, with more powerful monsters require a larger number of action points to attack. Spell cards are used as power-ups, often speeding up the player or hindering other opponents. Trap cards can be set, and are activated under certain conditions, such as receiving a direct attack. When players are attacked, they lose life points. Unlike the card game, where losing all your life points results in a loss, you simply spin out for a short time when your life points hit zero. The graph below charts the compatibility with Yu-Gi-Oh! 5D's: Wheelie Breakers since Dolphin's 2.0 release, listing revisions only where a compatibility change occurred.